No time to plan? Whether you want to explore our trails, rivers or mountains, leave it to the pros to help you discover Squamish from an insider's perspective through one of these expert-led tours. Enrich your Squamish experience on a guided "Talking Trees" interpretive walk with one of the Skwxu7mesh (Squamish) Uxwumixw First Nations people. Elevate your backcountry experience without the grind of elevation gain. Reach the top of Sky Pilot with a heli-hiking excursion through Black Tusk Helicopters or be transported into the remote huts of the Tantalus Range for an afternoon picnic with Blackcomb Helicopters. Ascend ladder-like rungs, cross exhilarating suspension bridges, and take in the scenic beauty of ocean fjords and snowy peaks all while safely attached to the rock with fixed cables. Located at the top of the Sea to Sky Gondola. Climb with some of the world's most elite climbers. Let professionals show you the ropes while guiding you up some of Squamish's classic pitches. Available in full and half day formats. Company: Canada West Mountain School, Mountain Skills Academy, Squamish Rock Guides and West Coast Wonders. Travel on a memorable nine-kilometre paddle to Brittania Beach for a morning beverage at the Galileo Coffee Company. This guided interpretive tour gives you the opportunity to experience a marine ecosystem that is beginning to thrive after years of industrial pressure. Watch for sea lions, harbour seals, seabirds, otters and more. Your trip includes gear, a guide, shuttle and coffee. Ride double and single track trails to Elfin Lake and back through Squamish's trail network in time for a relaxing evening. The tour includes a truck shuttle to 1000 metre vertical, local guiding and coaching, lunch and a jaw-dropping descent to the Squamish Valley on world-class single track. Bike from Whistler (90km) or Brandywine Falls (70km) to Squamish riding the Sea to Sky Trail. Follow your guide and explore the trail through a local's eye, the guides know all the best viewpoints! Transportation is included, and lunch and snacks can also be provided. Leave the map at home and let industry certified Guides lead you on some of the best mountain bike trails that British Columbia has to offer. Your trip will be catered based on your ability and is available in a half or full day format. Experience the rush of the rapids by booking a guided whitewater rafting trip down one of Squamish’s two main rivers. 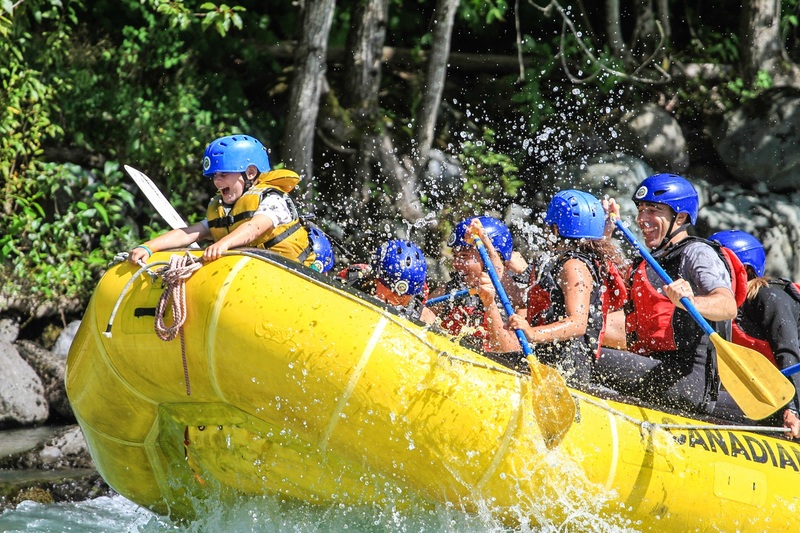 Family whitewater adventures are best spent on the calmer Class 1 and 2 rapids of the Cheakamus River whereas thrill-seekers will love the exhilarating twists and turns of the fast-flowing Elaho-Squamish River. Half and full-day tour options are available and come complete with all the gear and guidance you’ll need. Fishing is meant to be relaxing, take all the worry out of your trip by letting experienced guides show you the best local spots and methods to make your day a success. On a half or full day trip you can enjoy still water trout fishing or river fly fishing for char, Pacific salmon or steelhead. And the skills you learn will come in handy for all fishing trips to come. Take a boat across the Squamish River and follow in your guides footsteps ascending steeply beside numerous scenic waterfalls. Discover the coolest spots, each boasting some of the finest views in Squamish. Sail the seas of Howe Sound with this all hands on deck fully customizable sailing trip. Four-hour tours for groups of ten to twelve passengers per vessel are offered in afternoons and evenings. Depending on the occasion, choose between shared or private sailing, in either adrenaline or luxury formats. A la carte features such as dining, entertainment and water-access hiking are also available. Ever wonder where those "secret spots" are? You haven’t really seen Squamish until you’ve seen it like this. Flightseeing tours reveal hidden lakes, peaks and ranges and breathtaking views of the Sea to Sky region from an entirely new and exciting perspective that you can only witness from above. Try the art of capturing the wind in this 4-hour introductory course that starts off on land and transitions to 3 hours of water time. Qualified instructors will be with you every step of the way to help you catch air and soar with the wind. Let locals show you around and show you all the best spots to capture Squamish. On your tour, you will learn more than tips on photography. You need to know a place before you can really capture it, so each tour includes a glance at the local lore too! Super, Natural BC might seem like a major understatement once you’ve had the chance to explore Squamish from above.